My team and I have been touring Central and Eastern Europe this summer, and our travels recently took us to the Czech Republic. It’s a country with an interesting history, and from our perspective, it also holds a variety of interesting potential investment opportunities, too. It’s filled with lots of visitors from all over the world—I recognized both Korean and Mandarin being spoken on the streets in the beautiful city of Prague, and in our hotel there was a group of Japanese tourists. Clearly, they traveled a long way to get there! 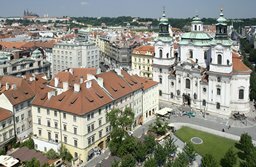 Prague is an attractive destination not only because of its history but also its collection of beautiful buildings and interesting architecture, an important draw for travelers. There are all kinds of architectural styles including Medieval, Art Deco, Beaux Arts, Baroque, Victorian, and extreme Modern (like the Dancing House by Frank Gehry). The Vltava River running through the city is a focal point, and the famous Charles Bridge decorated with baroque statues of saints is a great place to view the Hradčany Castle on the mountain overlooking the city. The Czech Republic (formerly part of Czechoslovakia) has seen periods of separation as well as unification with its regional neighbors throughout its history. The Czech Republic’s modern history centers around the peaceful “Velvet Revolution,” which swept the Communist Party from power at the end of 1989, and ushered in a renewed era of democracy and a market-based economy. In 1993, Czechoslovakia separated through a non-violent “velvet divorce” into what’s known today as the Czech Republic and the Slovak Republic. Today, the population of the Czech Republic is just under 11 million while the Slovak Republic’s is about five million.1 The Czech Republic has benefited from integration with the European Union (EU)—it became a member in 2004—although it has not yet adopted the euro as its currency. The Czechs have close relations with their western neighbor Germany; a recent survey from the Czech-German Chamber of Commerce (ČNOPK) revealed the Czech Republic is the second-most attractive country for German investors after Poland, from the 15 countries in Central and Eastern Europe.2 In fact, 88% of German investors would choose the Czech Republic as a place for their investment again.3 It certainly piqued my interest to find out why! Of course, our visit to the Czech Republic wasn’t solely to see the sights; it was mainly to scope out potential investment opportunities. My team and I visited one of the largest power companies in Europe. Currently, the company is being challenged by low energy prices because of capacity oversupply to Germany and declining coal prices that have restrained electricity prices in Central Europe. The Central European electricity market is now increasingly integrated, and electricity crosses borders freely, thereby creating a common market for power. We also met with officials at a regional sport-gaming company which also has operations in Poland. Like the power company, they are struggling to find steady profits in a competitive space. They told us that they and their competitors have been urging the local authorities in Poland to chase after the offshore Internet gaming operators who are not licensed operators and thus not paying local taxes. The tax in Poland on gaming is 12% of the gamblers’ stake which is among the world’s highest. This, of course, is a big competitive disadvantage for legally licensed companies like theirs. It is estimated that the size of the offshore, unlicensed, sports-betting business in Poland is nine times larger than the licensed market. So, the advantage of collecting taxes from the offshore market for the Polish Treasury is obvious. Despite these problems, the people we met with reported business was excellent during the 2014 Winter Olympics in Russia because of the high popularity of ice hockey in the Czech Republic. In fact, they said ice hockey would probably be more popular this year than football (soccer) because the Czechs did not qualify for the World Cup in Brazil. We then visited a company producing non-woven fiber that is made from polypropylene and used in the production of diapers. We asked the company officials we met with how they could be competitive in what essentially is a “commodity” business. They said they are spending a lot of time and money on innovation and working with their main customers to create new types of fibers. Overall, we enjoyed our visit to the Czech Republic and will continue to search for potential opportunities there.